Originally posted: August 6, 2018 . Last modified: November 28, 2018 . 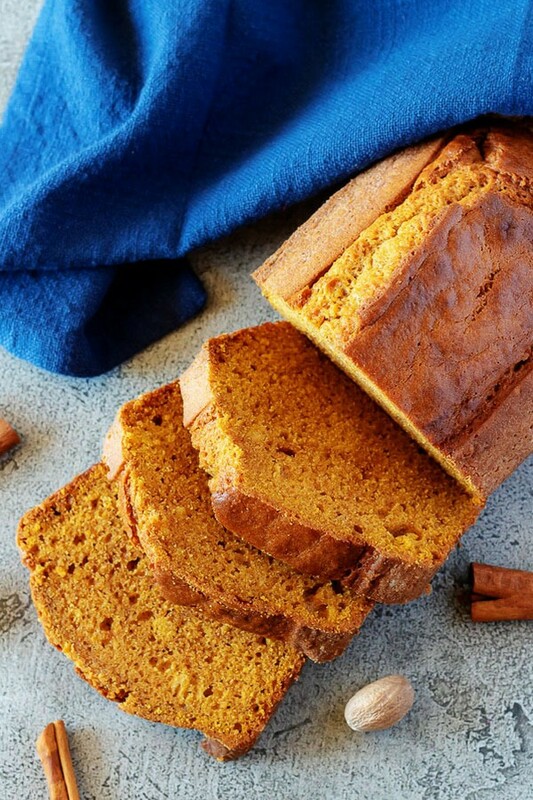 Our pumpkin bread recipe is moist and dense with warm notes of cinnamon, nutmeg, and vanilla. Pair with a cup of your favorite coffee for an autumn treat. Happy August! Fall is the best time of year and it will soon be here. It has some of the best foods, holidays, and of course, college football for the sports lovers. 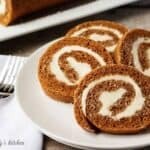 One of my goals this fall is to make more pumpkin inspired recipes like a pumpkin roll and homemade pumpkin pie. 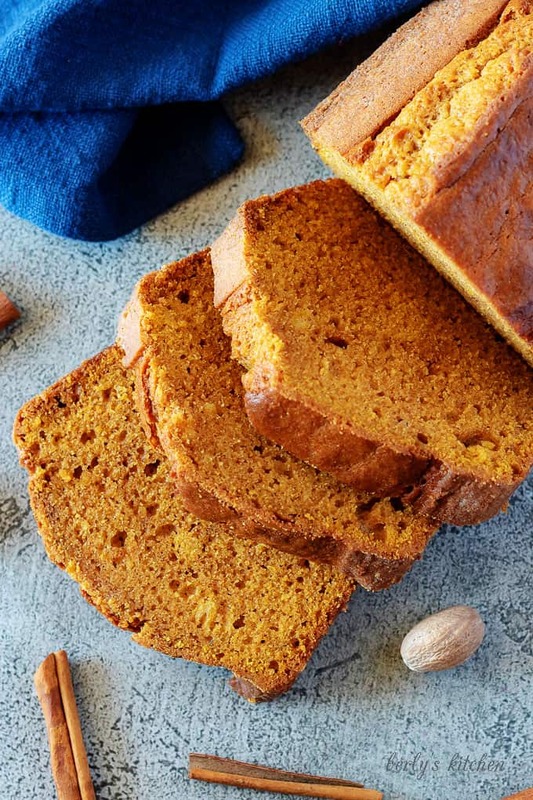 A classic pumpkin bread recipe sounded easy enough, so I thought I’d start there. After “testing” five loaves of bread, my family and I finally found the perfect one! Since pumpkin is not an ingredient I normally bake with, I decided to use a recipe out of a cookbook. The cookbook was one my grandmother had in her cabinet from 20 plus years ago. 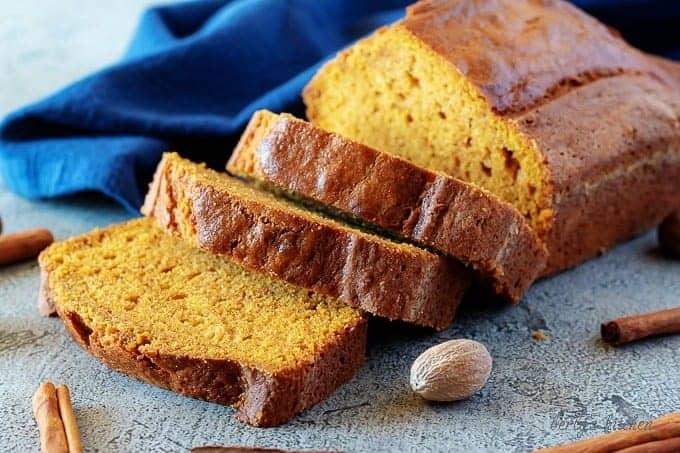 Who knew it had such a tasty and simple pumpkin bread recipe? This recipe makes two loaves, only requires one bowl, and stays moist for several days. First, preheat the oven to 350 degrees F. and spray two loaf pans with cooking spray or grease with butter and coat lightly with flour. 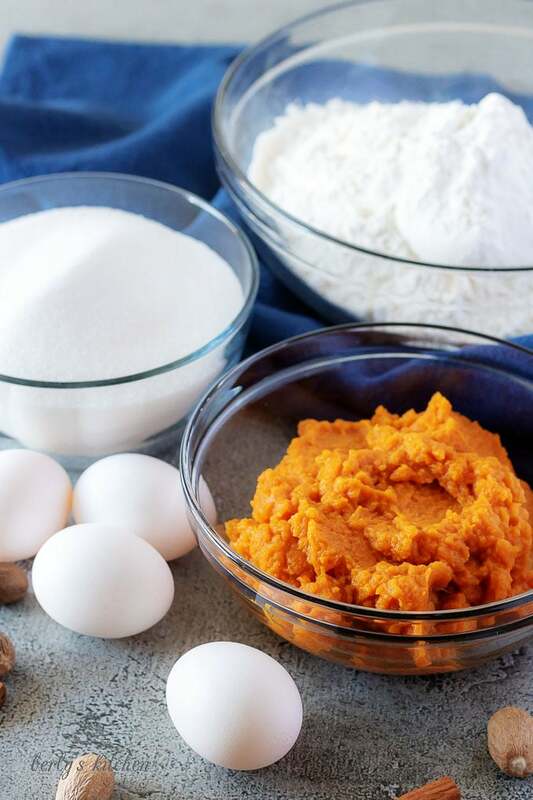 Next, add the flour, sugar, baking soda, salt, cinnamon, nutmeg, eggs, pumpkin, oil, water, and vanilla to the bowl of a stand mixer. Mix everything on low speed until combined and use a spatula to scrape the sides of the bowl as needed. Carefully pour half of the batter into each prepared loaf pan. Then, place the pans into the preheated oven and bake for 55 to 65 minutes. After 30 minutes, loosely cover the pans with a foil “tent” to ensure even browning. Last, remove the pans from the oven and allow the bread to cool for 10 to 15 minutes before transferring the loaves to a wire rack. It’s best for the pumpkin bread to cool completely before attempting to slice. Store the bread in an airtight container for up to 5 days. *Recipe adapted from the Pumpkin Bread recipe in the cookbook The Good Taste of Hope. To keep the bread extra moist, wrap each loaf in plastic wrap or store the loaf in a airtight Ziploc freezer bag. Please make sure all the dry ingredients are broken down and combined with the wet ingredients. Nothing is worse than getting a mouthful of cooked baking soda! In order to keep the top of the bread from over cooking, make an aluminum foil tent and place it over each loaf for the last 30-minutes of bake time. 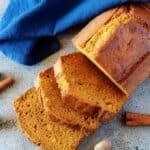 If you like this classic pumpkin bread recipe, please leave us a comment and rate the recipe card. You can also find us on Facebook, Pinterest, Twitter and Instagram searching for Berly’s Kitchen! Place all ingredients in the bowl of a stand mixer. Mix on low speed until combine. Pour half the batter into each pan. Place pans in the preheated oven and bake for 55-65 minutes. After 30 minutes, loosely place a piece of foil over each pan to ensure even browning. Bread is done when a toothpick inserted in the center comes out clean. Remove the pans from the oven and allow the bread to cool for 10-15 minutes before transferring to a wire rack. Allow bread to finish cooling before slicing. Cooking times may vary depending on pan type. Times listed are based on a glass pan. This looks like perfection in a pan! Yum. Why size of can of pumpkin? Hi Kimkim! 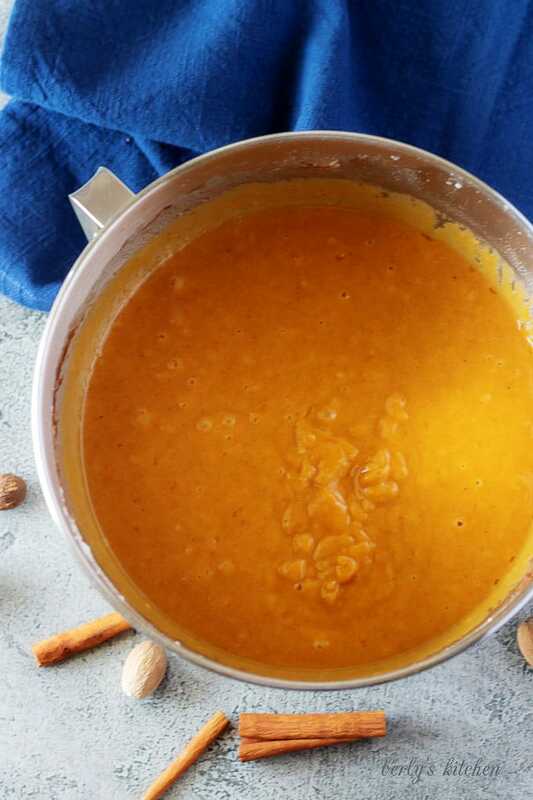 It’s a 15-ounce can of pumpkin puree.